Monday morning, April 28, 2008. Sandy in the front bedroom, me in the middle one. Just starting the week; wrapping up a MAS 90 sale; looking forward to some prospect visits later in the week. Typical overcast Spring day, possiblity of rain later in the day; lazy, hazy Monday. Libby Mills, my 87 year old mother-in-law, came up to the front bedrooms around mid-morning to let us know that there was some rough weather coming up from the Carolinas and might come our way later in the afternoon. We might want to turn the television on. Libby is legally blind but watches TV most of the day as best she can. She can see the blur of the “severe weather” scrolling and recognizes the “beep, beep, beep” weather alert. Turned the television on but did not see anything to speak of; some tiny spot of nothing down in North Carolina. Left the TV on but put it on mute…………back to work…………need to wrap up the deal for April. Ate lunch around 1 p.m.; no change in the weather; just high dark soft clouds, little to no rain and light winds. Around 3 p.m. or so; walked outside a couple of time to check out the sky…..really no change other than the clouds were thicker and slightly darker. Nothing that appeared to be menacing coming from the south/southwest which was the direction we looked as we stood in the front of our house and looked across the street at our neighbors’ homes and beyond. About 4 p.m. now; some school children getting home now, parents not home from work………..TV is picking up the urgency of the potential for a tornado but still no mention of Suffolk………. still Franklin and Windsor. Standing in the front bedroom I see Troy across the street come out on his front porch talking on the cell phone. 2 quick lightning strikes close to us; Troy bolts inside; power flickers; we laugh at Troy and begin to shut down our computers. Odd, do not remember any thunder just the intense crack of lightning. 4:15 p.m. No real change in the weather, rolling dark clouds, wind has picked up a little, no rain, none. I look in a south/southwesterly direction and can only see the dark & light divide of a line of storms to the south/southwest as I look beyond my neighbors’ homes. 4:18 Libby has come up to the front of the house to ask if we knew what was going on………..she is afraid and she has been hearing the heightened alerts from the weathermen. I am standing in the front bedroom looking out the large window. 2 things happen simultaneously; I see the funnel cloud a few hundred yards away coming in our direction with large debris in the cloud and then I hear the roar of the wind as it lets us know what the weathermen could not; the tornado is here, NOW. Sandy grabs her mom with me pushing them as we head towards the back of the house; towards an interior closet where all of us can take shelter along with our 135 lb. black lab, Sambo. Sandy is yelling at her mom to move faster as the roar of the wind continues to intensify around us. Sandy grabs Sambo who initally resists as he knows he must be in trouble for who knows what! He comes along as I know he can sense trouble. I am immediately behind them hurry, hurry, hurry!! We enter the interior closet and upon shutting the door the roar of the wind announces the arrival of the tornado. 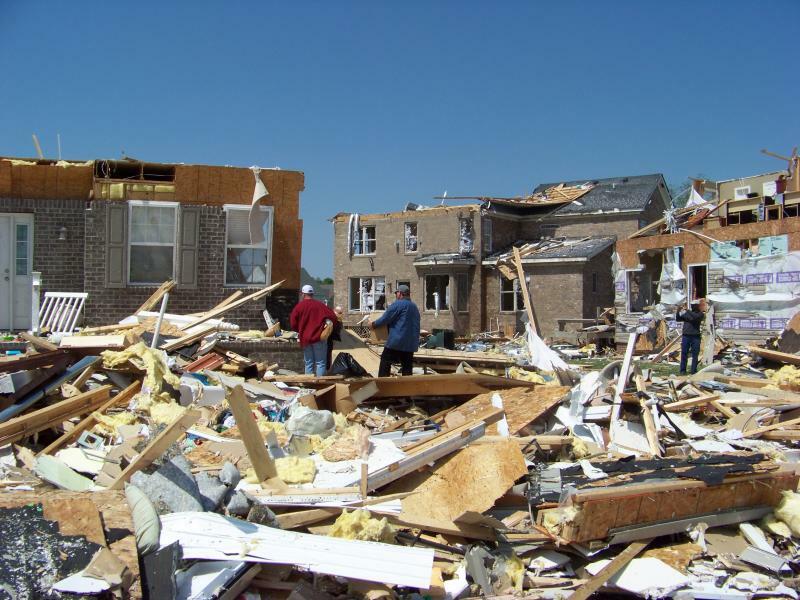 We can hear debris hitting the house, shingles being ripped off, Libby is screaming, crying…………. All of the windows in the house blow inwards, the door to the closet is pummeled with bricks, glass, whatever the wind wants. The walls, ceiling and door begins to shake and rattle……huge, terrific sounds of banging, booming and crashing are occuring………we lower ourselves, hugging each other closer, waiting for the closet door to blow and/or the walls and ceiling to collapse. Just holding on, waiting, nothing else we can do. I tell Sandy and Libby to remain in the closet until I can see what we have left and how we can get Libby out. The closet door opens in so it is not blocked; I open the door and the neighborhood has changed. Windows and walls are gone……………..and so is my neighbor’s home. I yell to Sandy that I have to go out and check on our neighbors. I cannot get out the front of the house as it is totally blocked with pieces of my house and all of my neighbors. I roll out the back; my neighbor and her 2 small children are climbing out of what is left of their home after riding the tornado in a bathtub. Neighbors run to attend to them. Neighbors are running to our section from everywhere wanting to attend to the injured and search for any that might be missing. I make my way around to the front of my house; I am hearing screaming and yelling. It is Troy ….scared and alone in a house that I cannot believe is still standing. I yell to Troy to stay put as he is not injured and in need of someone to come get him without causing the structure to fall in on him. I need to get to John across the way as I see him sitting on the ground slouched over with what is left of several homes surrounding him. It is raining now, hard……….I see a neighbor in what looks like a cut-up doll house if I could get a blanket for John…..she runs and immediately throws me several. I know John’s wife is out of town working so I ask him for her number. I am shocked he has the focus to tell me. I hold my phone to his ear as he is in severe pain and cannot raise his arms……….they talk (oh, God, please don’t let this be their final conversation)…he finishes and I talk to her; letting her know who I am and that we will be getting John to the hospital now……..emergency personnel begin to arrive on the scene….John is placed on a piece of someone’s house and is carried to a private vehicle that speeds off to Obici. Bye John, praying for you buddy. Neighbors who had been at work begin to arrive on the scene; we embrace in the middle of the street. I tell him where I saw his wife and children go……..gone, running, yelling; just to hold them…………………..safe! Matt comes running down the street with a hard hat, safety vest and a shovel he found on the way……….where is his dog, Bear. Have I seen Bear? No, no sound, no Bear……..I have a shovel………I will dig him out! Praise the Lord that Matt, Leslie and Bayle were not at home………………their house is gone! Out of nowhere appears a neighbor………I found a dog…….injured…could it be Bear….off they run. Firemen, police, rescue………….neighbors………..searching, looking, wondering???????? How can there be no fatalities????? 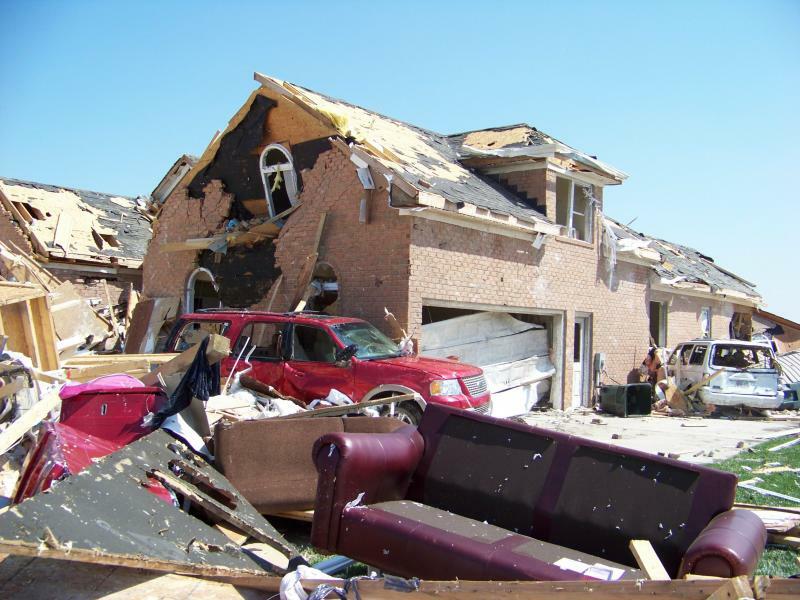 Homes flattened, moved, shifted; vehicles spun, flipped; flying debris. All spared? Steady pour now…….soaking what possessions that are left……..photos of cherished moments, family and friends…………baby momentos, wedding albums, things of those gone from long ago……….rain. All alone now………streets blocked, curfew set………..cannot get out yet, all vehicles destroyed, need to get Libby out……..Mike and Cindy are trying, trying, trying! Take a breath, reflect, think, give thanks……………a lot to be thankful for….the list goes on and on……….some items been there a long time…………some just added today. Sitting in the rain………….at peace with joy. Thankful for the quiet - work begins with the new day. Looking forward to it……………God is good!